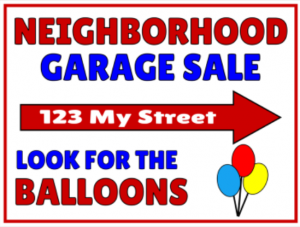 Check with your local government to see if there are any restrictionsregarding garage sales and promotional signage. Advertise online using Craigslist, twitter, on your Facebook page, gslr.com, or nextdoor.com. Put up flyers on local bulletin boards. Make clear concise signs that can be easily read from far away. Double check your signs by driving past them to make sure they are visible. Add balloons, pinwheels or streamers to your signs. 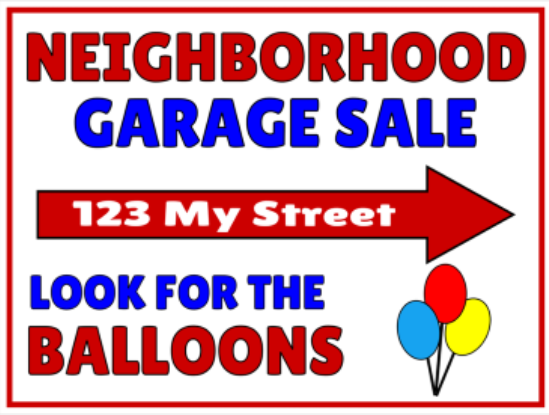 Invite your neighbors to join your garage sale, the more things you have to sell the more people will stop by! Decide what to do if it rains. Keep small bills on hand to make change. Have grocery bags available for sold items. Make sure all items are clean and functional. Display more interesting items in the front. Offer a “Free Box” towards front of sale. Have an extension cord and batteries available to show items work.